The Michigan injury laws for statute of limitations, malpractice damage caps, and negligence rules for car accidents are listed below. We find that these topics to be the most general and useful to our readers. If you need more personal injury information on Michigan laws and help with your case please contact one of our knowledgable attorneys. Michigan statute of limitations is like most states regarding the time you have to file a claim. You have 3 years to file a negligent conduct personal injury case, or 2 years for intentional conduct. You have 3 years to file a product liability case. 3 years to file a Michigan wrongful death claim. And 2 years to file a medical malpractice claim, or 6months from the discovery date. These are the general rules on time for filing. Each rule can be slightly different depending on the case. 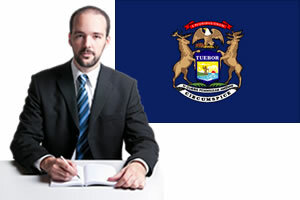 Speak to a Michigan personal injury lawyer for details about your case. These rules apply specifically to car accident cases. In Michigan you can't file a lawsuit unless it's for serious injuries and when you collect for medical bills you collect from your own personal injury protection insurance. Basically, both parties involved get benefits from their own insurance companies. In Michigan cases, you can get benefits from your insurance company such as medical expenses, income or wages lost, nursing services, and even more. This percentage rule along with comparative negligence means that you can sue if the other party was responsible for 51% or more of the accident. On the other hand, if you are responsible for 50% or more of the accident, you cannot recover damages by suing. An attorney can help you prove negligence. Are there Damage Caps in Michigan Injury Law? The damage caps for medical malpractice cases in Michigan for non economic cases is $408,200. If the case is regarding a disabling injury or catastrophic injury, such as brain or spinal cord injury, the cap is greater at $729,000. The Michigan damages cap adjusts annually with inflation. It's always a smart choice to speak with a Michigan malpractice lawyer for damage caps regarding your specific case.